All transactions are safe and secure with a reliable history in online purchasing behind each of our associates. 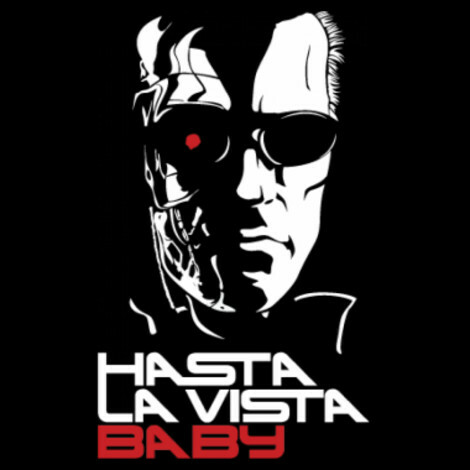 Buy the Hasta La Vista Baby t-shirt to own Terminator clothing and merchandise. In order for the T-800 Terminator to blend in better, John Connor taught him some key phrases so he didn't say anything odd like "affirmative". He picked up on the new terms quickly, including his famous quote, "Hasta la vista baby". Celebrate his knack for learning with this Arnold Schwarzenegger shirt. If you prefer something less specific, check out the other Terminator tees and clothing merchandise. In addition to the Hasta La Vista Baby tee above, browse the Terminator Clothing Gallery for more apparel like men's and women's clothes, kids shirts or hoodies.